Paradise Found. A pristine tropical island replete with soaring cliffs, primeval forests, white sand beaches, azure lagoons, myriad flora and fauna as well as archeological sites of ancient importance. Privacy, Peace, Nature and Vitality are part of every breath and every moment. The incredible beauty and serenity of the place is topped only by the heartfelt service of the native staff. The Wakaya Club and Spa is an intimate luxury resort on a 2,200 acre picture perfect private island. From the moment you arrive via Wakaya’s Cessna Grand Caravan private aircraft, you are completely immersed in the peace and tranquility of your new island sanctuary. The Wakaya experience is totally inclusive and comprehensive with all food, beverage and activities (with equipment provided!) included in the daily rate. Privacy is ensured with only a maximum of 28 guests and a ratio of 12-1 staff per guest allowing for a truly seamless experience. 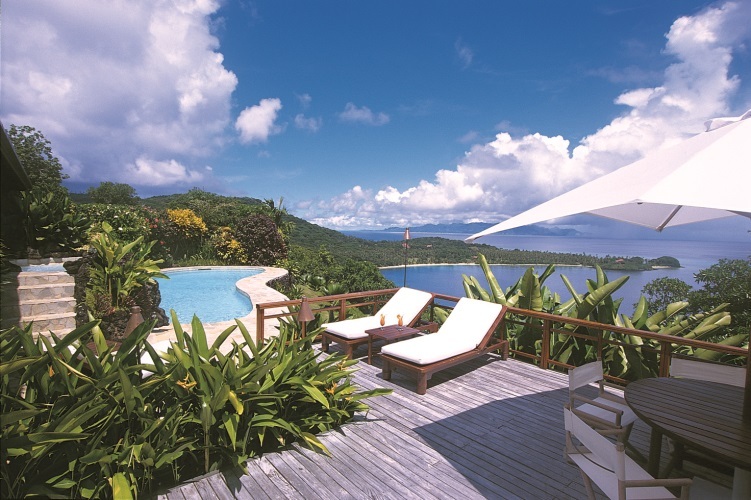 Each 1650 square foot Garden and Ocean View bure is a luxurious hideaway located just steps from the Pacific Ocean, and is designed to indulge you in the beauty of the island while providing every conceivable comfort. To truly indulge, choose the larger Governor’s Bure, Two Bedroom Ambassador’s Bure or Royal Three Bedroom Villa of Vale ‘O on its own16 acre estate. With an emphasis on organically growing and producing as much as possible directly from the virgin soils of the Island’s unspoiled, super-rich volcanic earth, dining in itself is a healing activity. You can feast on your choice of fantastic breakfast selections including tropical island fruits and fresh eggs from Wakaya raised organic chickens, enjoy a truly fresh catch and a salad of garden lettuces and micro greens for lunch and savor creative selections of Wakaya raised organic game and produce for dinner. Also included as part of the stay, enjoy beverages that include regional wines, freshly squeezed juices and tonics, coconut water, cocktails and soothing tea made from organic ginger grown in our own jungle paddocks. Also be sure to try The Wakaya Perfection Organic Ginger Margarita for a unique treat! Guided nature walks, watersports, yoga, golf, tennis, croquet and a fully outfitted gym keep you active, while picnics on your own private beach and hammocks strung between the coconut palms await your relaxation time. Tour Wakaya’s organic farms, scuba or snorkel the marine preserve directly in front of your Bure or have a lesson with Wakaya’s golf/tennis pro all included as part of this fantastic experience. Splurge with the Breeze Spa’s signature–a three hour private couples’ retreat consisting of two treatments of your choice followed by breakfast, lunch or dinner of organic spa cuisine served in a tranquil environment overlooking the serenity pool and turquoise sea. The Breeze Spa—designed for the ultimate spa experience for two. Palm Grove Restaurant offering organic Pacific rim cuisine using the best locally grown and carefully sourced ingredients. Adults only (16 or older welcome) except during designated family periods or at Vale ‘O year round. 40 Minute flight from Nadi Airport.